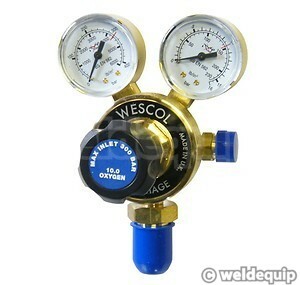 Premium quality British made Oxygen gas regulators. Solid brass construction with twin gauges, one showing the cylinder contents pressure and the second showing output pressure of either 0-3.5 Bar, for finer welding & light duty cutting applications, or 0-10 Bar for general welding/cutting & heating applications. 300 Bar rated for service at increased gas cylinder pressures, so fully compliant with the latest gas cylinder regulations; individually date stamped to meet BCGA - British Compressed Gases Association - code of practice, which recommends regulators be replaced every 5 years.